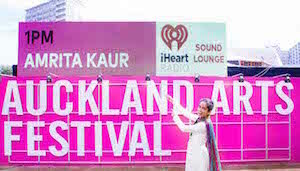 Malaysian-born kirtani Yadwinder Singh posted on his Facebook about his daughter, Amrita Kaur, taking part in a New Zealand arts festival. A rather reluctant Amrita agreed to share her experience with Asia Samachar. I am not sure if I deserve an article yet, but here is a record of my experience singing for the Auckland Arts Festival iHeartRadio Sound Lounge on 17 March 2015. The Auckland Arts Festival is an annual event that occurs in and around the city from the 4-22 March. It is – in the words of the festival organisers – a celebration of people, place, culture and art. A time to come together as a community to laugh, to cry, to be amazed, to contemplate and to imagine. It gives artists a place to showcase their art to a wider audience and encourages diversity and different art forms from around the world. The programme manager of the Auckland Arts Festival got in touch with me one day to be a part of the outdoor music lounge part of the festival in Aotea Square (a public space in the middle of Auckland City.) His colleague, a family friend of ours who had also been a mentor for me during my architecture degree, Ariane Craig-Smith, referred me. After I sent some links of previous performances/clips, the contract of the hour-long performance was sent to me. My first ever singing-related contract! I was very excited to perform and try to experiment with some things that were new for me. We got Basant Madhur on Tabla. He is probably the most renowned and friendly table player in Auckland and runs a very successful Indian music school called Sargam School of Indian Music. I am a part of the school as I have learnt classical Indian music from Prof Shukdev Madhur, Basant’s dad. And Antion Vikram Singh on the electric guitar – an extremely skilled and well known musician in the Sikh community and the western world as he was a member of a very famous band in the 60s. He then left the music industry in Los Angeles to follow the path of Sikhism and with that, Indian classical music. He performed in the Auckland Town Hall (our stage was opposite the building) in 1967! There was no question that my dad and I would be performing together. He was undoubtedly the most important person – sorting out the sound, directing me on how to sing etc. I don’t know how to give his background. I am fortunate to be able to sing with him from when I was a young child and learnt so many things from him along the way. He had a severe cold and sore throat on the day, but that meant he had an extra “basey” voice to sing with! For the programme, we started off with a shabad about Guru Nanak from Varan Bhai Gurdas ji, Kal Taaran Guru Nanak Aaya. It felt incredible to sing this shabad outdoors with the winds blowing, something that I cannot explain in words. After that we did another shabad, Mere man prem lago har teer, originally sung by Sonu Nigam. This was followed by the slow rendition of Chidiyan da Chamba, a traditional Punjabi song. We finished off with a classical chota khyal in Pooriya Dhanasri with a tabla solo at the end. It was an unforgettable experience – the music, the environment and the people. I am very grateful to everyone who helped to make it happen. Also, in the last few days I was asked to be a part of the Tauranga Arts festival later on in the year as well, but unfortunately wont be able to take part as my masters thesis is due the week after that! Watch video to see Amrita and team in action. Gurfateh Yadvinder Singh Ji (Jaggi). Congratulations to you and Kanchan Bhenji as you both have fulfilled the responsibility of parents by putting your child of the path of Gurmat and making them proper Sikhs of Guru Maharaj. May Guruji bless all of you.